stove or there is also electric heat. Chopped wood is provided. beautiful wild and scenic Smith River. We were very comfortable and had everything we needed during our stay. Also had a nice private side yard for taking the dog out. Enjoyed our stay! Very quiet and convenient location. Cabin was clean and well kept. Jennifer was a wonderful host. This cabin is super comfortable and well stocked with everything you need. 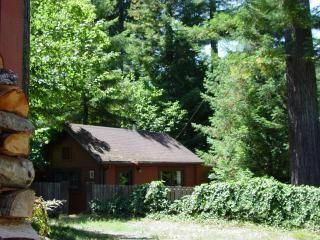 If you have come to this area to enjoy the Redwoods National Forest and Park and the ocean this cabin is in the ideal location. You can walk to some Jedediah Smith NF Trails right from the cabin or drive to many others within 15-20 minutes. The ocean beaches in Crescent City are only 15 minutes away. We loved this cabin and enjoyed cozy evenings there after full days of exploring and hiking in the magnificent Redwood Forests. Highly recommend this VRBO. We would definitely return. Wonderful setting in the Redwoods! We enjoyed our stay very much. Jennifer was friendly, helpful and ready to answer any questions we had. The cottage is cozy, comfortable and clean! Easy access to nearby parks and trails! Thanks so much! So glad you enjoyed your stay! Loved it!! Highly recommend staying!! We stayed for a get away and my brothers wedding in the redwoods. I would come back again for sure! We were busy most days and didn’t get to hang out in the cabin but for the time we did it was wonderful! Very home like, you never felt like you were in a hotel and that is what we wanted!! So glad you enjoyed your stay! Hope to see you again sometime! My wife and I had a wonderful time at Jennifer's cabin. We look forward to going there again. Thanks so much! Enjoyed having you! Glad you had a good time. Hope to see you again sometime. include hiking, biking, swimming, canoeing, kayaking, beachcombing. Oregon coast and to the Oregon Caves within easy reach.